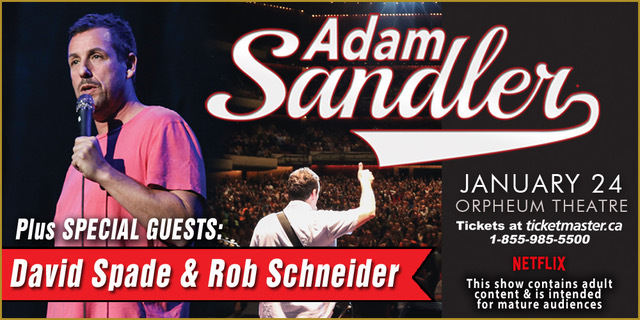 PMC | Adam Sandler with Special Guests David Spade, Rob Schneider & Nick Swardson! Adam Sandler with Special Guests David Spade, Rob Schneider & Nick Swardson! Vancouver, BC, January 16, 2018 – Paul Mercs Concerts is pleased to announce that actor, stand-up comedian, screenwriter and producer, Nick Swardson, will be joining Adam Sandler, David Spade & Rob Schneider on stage for this exciting concert! Vancouver, BC, January 4, 2018 — Paul Mercs Concerts is pleased to announce that fan favourites David Spade & Rob Schneider will be joining Adam Sandler on stage for this exciting concert! Vancouver, BC, November 20, 2017 — Paul Mercs Concerts is pleased to announce this exciting concert date of Adam Sandler, with surprise special guests who will be announced in the very near future! A successful actor, writer, producer and musician, Sandler’s films have grossed over $3 billion worldwide and include box office hits such as “Grown Ups,” “Just Go With It,” “Bedtime Stories,” “You Don’t Mess With the Zohan” and “I Now Pronounce You Chuck & Larry.” In 2014, Sandler signed a deal with Netflix to produce and star in four original movies to premiere on the streaming channel. The first three films, “The Ridiculous 6,” “The Do-Over” and “Sandy Wexler,” were the most-watched movies on Netflix to date, which led to Sandler signing another deal with Netflix for four more original movies. Currently, Sandler has just wrapped production on the Netflix comedy, “The Week Of,” which co-stars Chris Rock and premieres globally in 2018, marking the fourth movie in Sandler’s first pact with Netflix. Sandler is co-starring in Noah Baumbach’s “The Meyerowitz Stories,” which premiered in theatres and on Netflix in November to glowing critical reviews. Tickets available at ticketmaster.ca, 1-855-985-5500, or all Ticketmaster outlets. Copyright © 2018 Paul Mercs Concerts. All rights reserved.